Rhapsody is a fully upholstered armchair with flowing lines and contemporary styling. 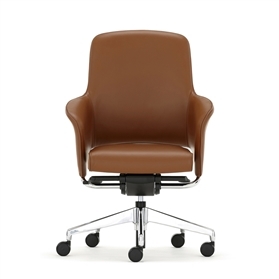 With its generous recline and enveloping upholstered wrap around form this design provides the very best in comfort and relaxation for executive decision makers. Rhapsody’s curvaceous form, separate seat and cantilever back make this chair a product of beauty to complement the smartest of interiors.